In here you'll find Crochet, Knitting, Pottery, Crafts, Book Reviews, Recipes, Animals and Gardening, Everything but a Moose! If you are interested in learning about creating a sacred space or even just a tranquil space in your backyard, this book has wonderful ideas for that. If your interests lie in creating a kitchen garden or an apothecary garden this book is for you. The way it is laid out and the writing encourages you to take what information you need to create your own place in your own time, and allows you to have a space that works for you. It's not a cut and dry blueprint, everyone has their own needs and this speaks to that part of a person that needs healing. Bloom encourages the reader to use all of their senses, not just sight or smell but also touch and hearing and to use those senses to bring times to your garden that a uplifting and comforting to all five senses. She points out that we should be aware of how colors or scents affect us, is it a positive thought, do certain plants evoke memories? I know I will always associate some plants with my grandmother and I find that I add those to my garden every year, just to feel close to her. Other parts of the book discuss what kind of garden you are trying to create, all garden can be beautiful but why not create an area with a deeper meaning., Such gardens could be for memorials, spaces for healing, energizing you mind or just relaxation, a space to escape from the stress of the everyday world. If you decide to delve into the world of plants for apothecary purposes or even kitchen purposes, the author shows how to harvest, preserve and collect seeds for the next growing season. Then there are recipes for teas, tinctures, essentials oils and lotions. 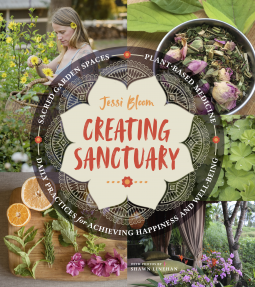 Over all a garden means so many different things to different people, and this book is a wonderful resource for creating your own Sanctuary. Becoming more attuned to the natural elements around us will help us to leave the stresses of daily life behind and enjoy our time just a bit more. It is not just for the advanced gardener since it has information how to have an intentional design in mind, what to plant and where to harvesting your seeds. Creating Sanctuary is a great resource that I plan on adding to my library. Thanks to Timber Press and Net Galley for an Electronic copy of this book in exchange for an honest review. Trees are one of those things that are so present in our lives but we blindly pass them everyday with no thought to their origin or age, we might notice simple things such as the change in leaf color, blooms or the absence of leaves. What if we slowed down and spent a bit more time taking in our surroundings, to be more present in our lives be more involved in our environment, what a difference it could make. 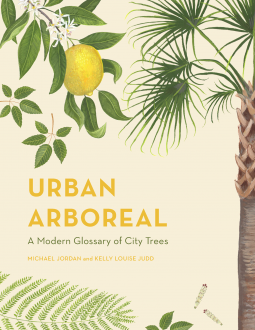 This beautiful book will encourage you to become a Arboreal Tourist, to have a chance to touch history and be a part of something larger than yourself..
Urban Arboreal harkens back to victorian times with their engraved Botanical illustrations. Each of the 70 trees included in this coffee table size is given with its location, common name and latin name. A bit of history is also included, some from when they were planted, the myths associated with them and how to find their locations. It helps the reader to gain a better understanding of the importance of the trees in our communities, and how they have touch so many lives before our own. They are so so endangered by urban sprawl, we must learn to recognize their importance as well as their grace to ensure that they are not taken from us forever, this book is a large positive step in that direction. From New Zealand's Christmas tree, the crimson flowered Pohutukawa to the ancient Cotton Tree in Freetown, I was enchanted by all of the variations of trees living in urban areas. The drawings are exceptional and the stories are very diverse. This would be a wonderful gift for anyone interested in botany or travel, it covers both categories effortlessly. 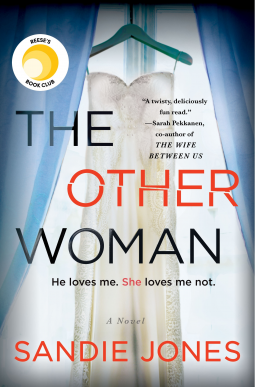 WOW, If you haven't heard about "The Other Woman" make a note now and make sure that it's at the top of your to read list. This is Sandie Jones Debut novel and it's not to be missed. Beprepared to stay up late to finish this book, it pulls you in and refuses to let go until the bitter end, and what an ending it is. Sometimes love finds you when you least expect it, and Oh Boy has Emily found the man of her dreams; Adam. While she wasn't looking for a relationship, everything is moving along so wonderfully, then it's time to meet the family, Pammie, Adam's mother, It starts off well but too soon it is evident that Pammie will do whatever it takes to destroy their relationship. It's a love triangle like no other and the only real question is; who will be left standing at the end. Sometimes things are just not what you think even if it's standing right in front of you. I was hooked from the beginning, wondering what truly horrible thing Pammie would dream up to cause a strain between Emily and Adam. The characters are well written, the story line pulls you in. I loved to hate Pammie, and was always surprised how each situation escalated and then couldn't wrap my brain around why he was so blind to his mother's antics. Thankfully Emily has a great support system in family and friends,and while they are only side characters they helped to bring the storyline to life. After all who hasn't run into someone that just seemed to not to like you at first blush. The Other Woman is full of psychological suspense, twists and turns and a real shocker at the end. You'll have problems putting this one down until the very satisfyingly but shocking ending. I'm hoping that Sandie Jones has more stories to tell, while this one will be hard to beat! This seriously could be the next summer block buster! Thanks to NetGalley for an Advanced Reader Copy for an honest and thoughtful review. 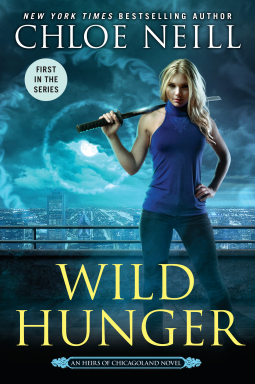 Wild Hunger is a spin off or second generation of the "Chicagoland Vampires" Series. Elisa Sullivan has escaped Chicago to Study in Paris, partly for an education and partly to slip away from the notoriety for being the first child ever born to vampires. Her Parents, Merit and Ethan Sullivan are the focus of the original series and Wild Hunger is the first book in the Heirs of Chicagoland series, which introduces us to Elisa, as well as Lulu the daughter of a very powerful witch, and Connor the son of the Apex to the Shifters. The storyline starts with a literal bang and a then a jump, when Elisa is forced into the conflict between house and countries, on the eve of a trip home to attend a peace conference, hosted by her parents. Once she arrives home she is faced with one challenge after another, some personal and some public. Elisa is her own character, she does have a great blend of her parents characteristics; bold and fearless but she also views herself as something "other" or a monster, which can also be a throwback to how Merit viewed herself in the beginning of the original series. You are gifted with a small amount of back story between Connor and Elisa, which helps shape your understanding of their relationship. Connor is ever the tormentor but also a protector, and since they haven't seen each other in the last four years they have both matured and grown as people, which sets us the romance portion of the storyline. A friend, Riley Sixkiller, who is also the former love interest of Lulu, is accused of murder, peace talks are side tracked and there are some not so friendly fae on the loose. Elisa and Conner must make choices between loyalty and friendship to save Chicago and themselves. If you were a fan of the original series, you'll feel right at home, even though twenty plus years have passed since the ending of the original series, somethings have changed but the characters are the same. If you haven't had the pleasure of reading the original series you can still start here. There are lots of references to prior battles and characters but there are also enough details given that you won't be lost. But I do suggest to pick them up as soon as you can so you can truly enjoy this book. Chloe Neill knows how to write action but the romance, friendship and loyalty still shine through. Strong and smart female leads with some violence but an interesting read for most any age. Much Thanks to Net Galley and the Publisher for the free copy in exchange for an honest review. 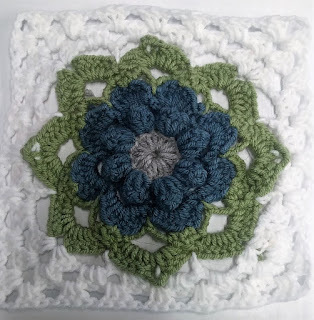 Just a short post today, I have a finish, some progress and a pattern that I just couldn't resist (that I hope to get to in the next couple of years..). First up is my finish unfortunately he's not on my list for the year but I'll take yarn moving out of the house any day. I had a preview last week and I finally found some eyes so I was able to finish him off and get him stuffed and ready to go. He should be landing in his new home next weekend! He's such a happy guy! On to the pattern that I just couldn't say no to. 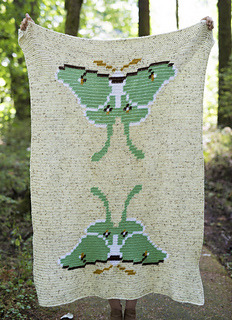 The Luna Blanket by Hailey Bailey. 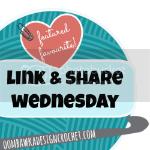 Did you know that last Wednesday the 15th was Granny Square day on instagram? 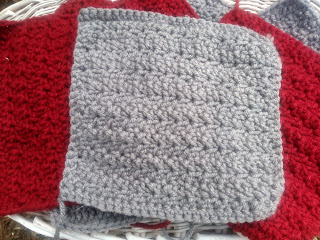 I worked up a couple of squares but decided on this one..
All of the samples went into a bag for future blanket ideas! 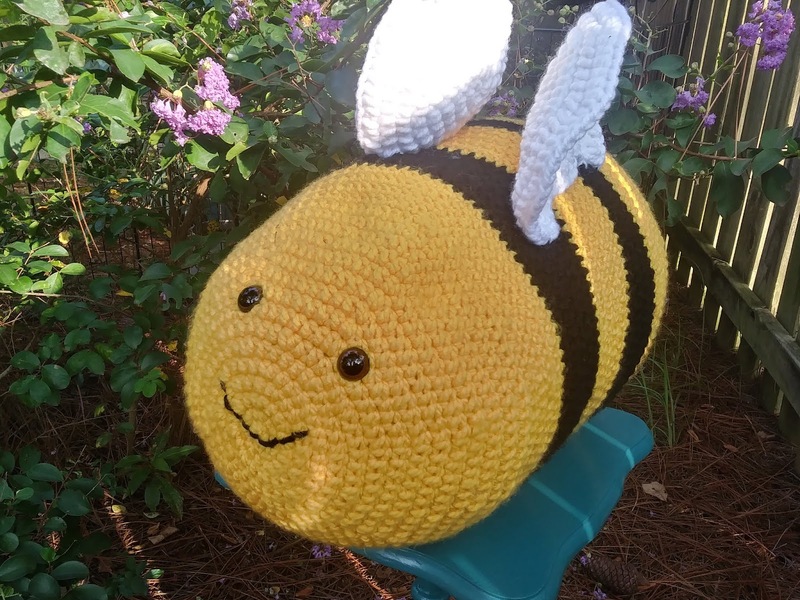 It so much fun to see the virtual blankets that people put together, and to think that so many squares traveled all over the world virtually on one day is a tribute to crafters and crochet. I have made some progress on the CAL, square 2 is finished, it's a moss stitch so not much to see, but I'll be starting square 3 this week and I could be caught up by the time the next one is released. My crafting time this week might be taken up with pumpkins, Canning ring and fabric, and maybe a crochet one or two, since fall is right around the corner and the orders are coming in. So I'll give a bit of a small update on the Cold sheep while I'm here! Wishing you a very Crafty and Productive week! I've been a bit absent, not much crafting going on and then computer issues. I managed to get the thing working earlier in the week and then when I was ready to post it wouldn't even turn on. I think it is a conspiracy between the yarn and the laptop. Not much headway with either one! SO I'm a bit late but here is a bit of an update. I did manage to add a few squares to the Peach Blossom Blanket, it seriously shouldn't take this long to get it together. I was making sure of the layout again before I joined any more, this isn't a great shot but it was the one I'm using to keep me on track. I have completed a couple more of these. 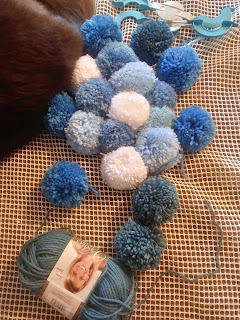 Also added some more pompoms to my rug, again with the help.. 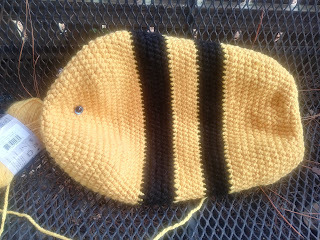 I've gotten side tracked with a couple of orders, While it looks like a goldfish, or maybe I'm just craving cheese crackers, this guy will be a bee pillow. I'm hoping to have him delivered by next weekend. 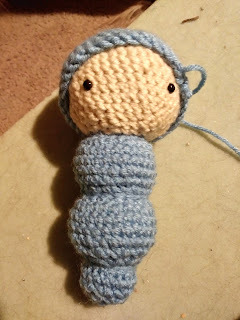 Just trying to find a little bigger eye then I can finish up the stinger end and attach the wings. This guy is another order and will eventually be a butterfly, once the bees is done. I bought the book Beetles Bugs and Butterflies by Lalylala and I've been wanting to make a few but just haven't had much crafting time lately. And since I haven't had much time to work on the projects on my list I had to start something new..Well it had been on my radar, but I wasn't going to start it until later in the year. This is block one of Stitch Story CAL by Heather who blogs at Keep Calm and Crochet on UK. I'm a bit behind and to make it worse (better) I decided to do two blankets, both for Christmas Presents. She is only on Block 3 and if you are interested it wouldn't be hard to catch up on or save for later. I've decided it's time to move a few things along, weight included, so I'm spending at least an hour at the gym each night, add canning season and work, the crafting is falling a bit behind. Which doesn't stop the requests from coming in. I'll be working on pumpkin items soon and I hope to get back to some of my list before too long. The cold Sheep is still on track and I'll post numbers next week. 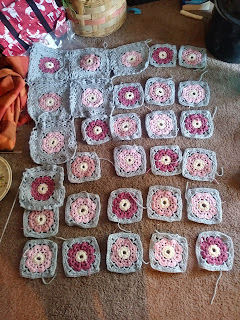 And did I mention that this Wednesday August 14th is Granny Square Day? Surgal27 on instagram curated the idea on instagram a few years ago but this year it is being passed on to Simplycrochetmag. 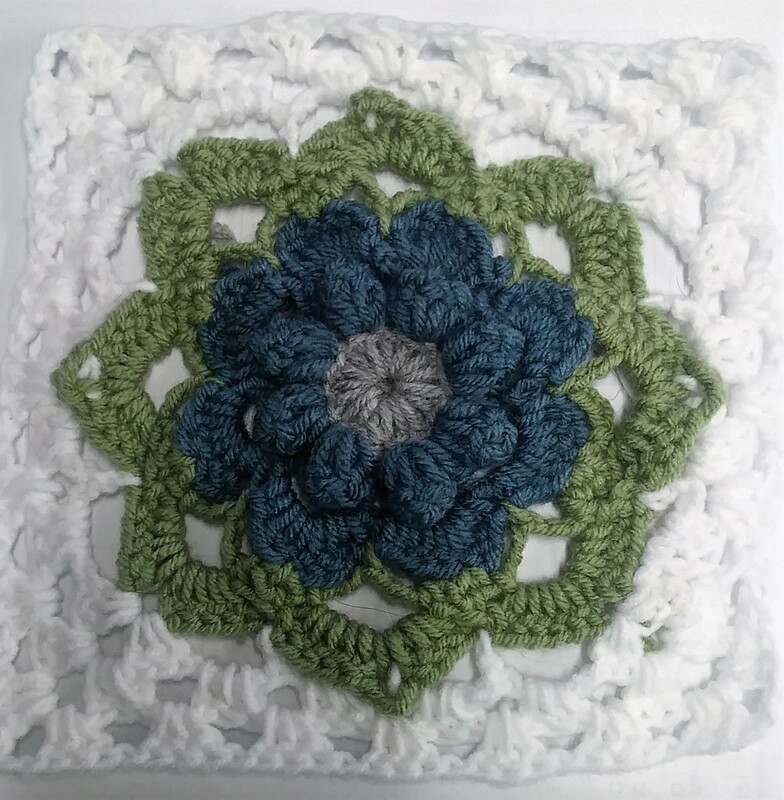 If your on instagram and are interested in playing along, just crochet a granny square, take a full frame picture and post with the #grannysquare2018. I'm working on a couple of different colors and designs, I'll be sure to post them all on my blog but only my favorite will make it to the farm2ewe instagram account. In years past squares were combined to make a virtual blanket, it's so much fun to be part of something that is enjoyed all over the world. Thanks for sticking with me and if you're looking to join the Year of Projects there is no time like the present! Have a wonderfully crafty week! Like many crafts, Cross Stitch is finding it's way with a new generation and Improper Cross Stitch is exactly what many people have been looking for. I've been doing crafts since I was allowed to (not) run with scissors and I would have loved this quirky book back then as much as I do now. 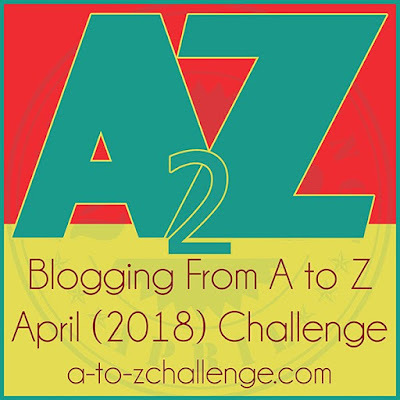 It begins with a great introduction to Cross Stitch, the standard how-to for stitches and what the count on fabric means, along with how to read charts. So this book works for the very basic beginner to a crafter that has been stitching for a while. 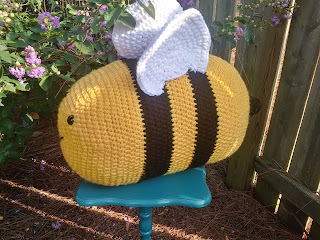 There are full color photos alongside the charts, which helps a beginner to see what a finished project should look like. 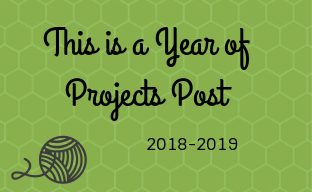 There are 35 + projects so there has to be something for everyone. I received an ARC of the book and it contained just a couple of charts, "Grammer Police" is my favorite, I'd definitely do that one for my mom and daughter, and there may be some included that aren't for all audiences but nothing that I saw would preclude me from buying it for any ages that were interested. Most projects seemed like ones that could be completed in a short amount of time, which is all most of us have for crafting lately. After all it can be fun to be a bit improper! I'll be on the look out for this book during the holiday season. 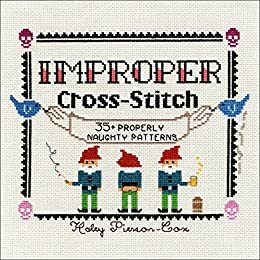 I think it would make a great stocking stuffer or quick gift for anyone looking to get into Cross Stitch or a quick craft with a bit of attitude! Thanks to Net Galley and the author for an ARC of the book, it has just come out on August 7th so make sure to check it out on Amazon and in your local book store, If nothing else you'll get a great laugh and just maybe you'll end up with a few presents of your own. As a personal aside, this is available on Kindle, which is the version I had and I would spend a bit more and get the hardback. I have other craft books on the kindle and it can be difficult flipping back and forth to find the right pages to refer to when working a project. 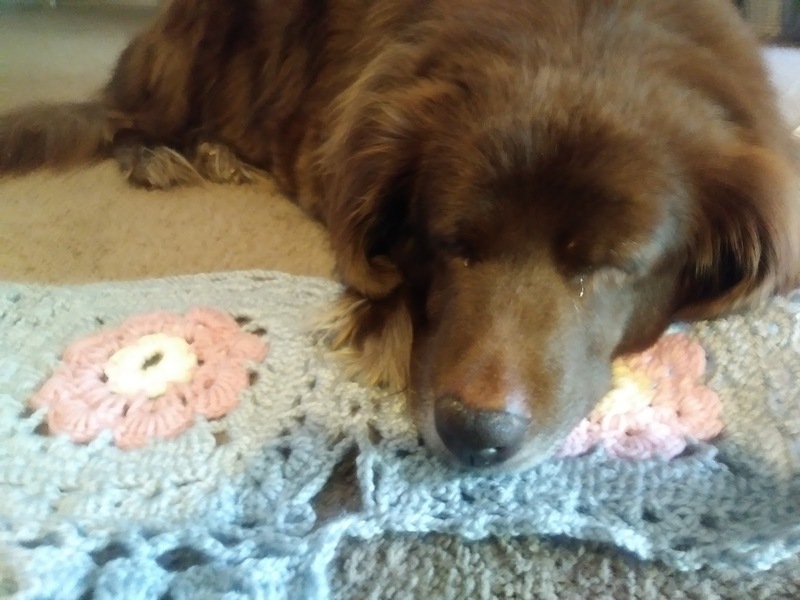 I'm just a happy East Coast Southern girl that dreams about Moose and plaid and nature but along with that, you'll find Crochet and other Craft ideas, Vintage Finds, Book Reviews, Snipits about our Dogs/Cats/Chickens, Gardening ideas, Home Inspiration and of course some DIY. Take off your coat, grab a beverage of your choice and visit with me for awhile, I think ya'll be glad you did! Are you looking for a great new read- Check out some of these!